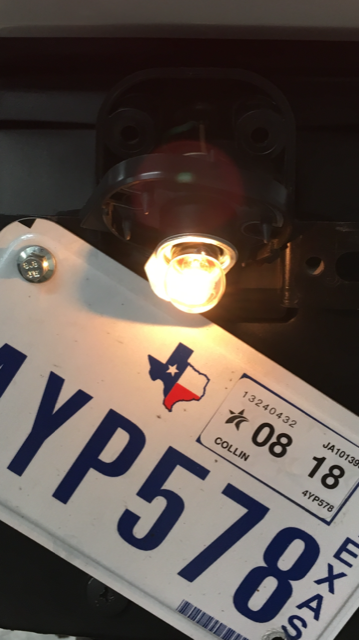 Here is my 360* LED license plate bulb conversion. Nice and bright. 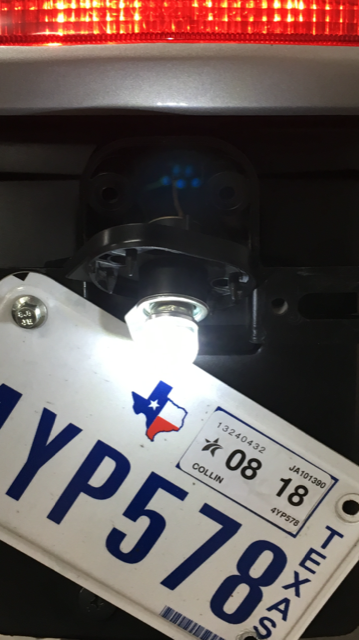 I've got leds on my FJR, and they are 'kin bright. 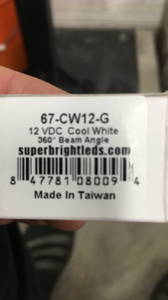 Leds are brilliant. Over the years, for whatever reason, lack of concentration, advancing age etc. I occasionally forgot to cancel my indicators in a timely fashion. I thought about putting a timed sounder in the circuit but decided that would be irritating. So, for NZ4.50 (USD3.12) off EBay I bought 2 green LED number plate lights and fitted them to the front fairing bracket. 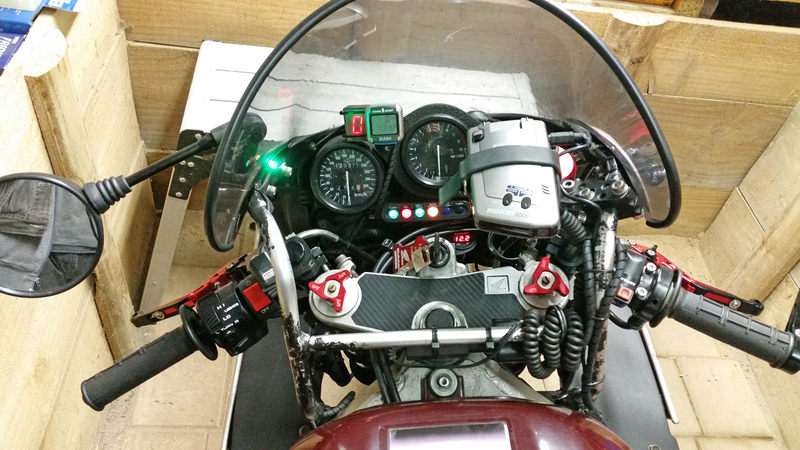 Though it looks as if it does when I am sitting on the bike the radar detector (which I use on highways) doesn't block the original right hand instrument panel mimic light for the right hand indicators. 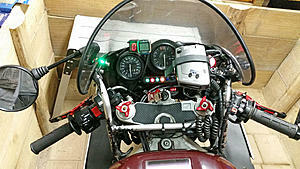 I had already fitted LED indicators (with rate mod) to the bike. That's one heck of a cockpit you've got there. I wouldn't be able to ride that bike, since I barely can keep up with the speedo. Thank you for your concern but you are incorrect actually I do keep my eyes on the road. After 40 years of riding and 125,000 kilometres on this bike alone I know whereof I speak. Note the high position of the gear indicator and the Sigma, just a flick of the eyes to note these and I don’t watch the radar detector it is plugged into the headphones in my helmet giving timely reminders to check my speed because I mostly ride eyes up rather than down. Gear counter because of occasionally looking for 7th gear or riding in 5th thinking 6th. The Passport radar detector was recommended by the police after they tested a bunch of them. 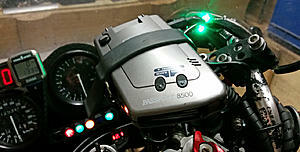 As I remember their reasoning was; radar detectors are legal so you should buy a good one. Telling you guys to ‘just slow down’ isn’t working. Logically, we traffic police are most active in areas where accidents occur i.e. 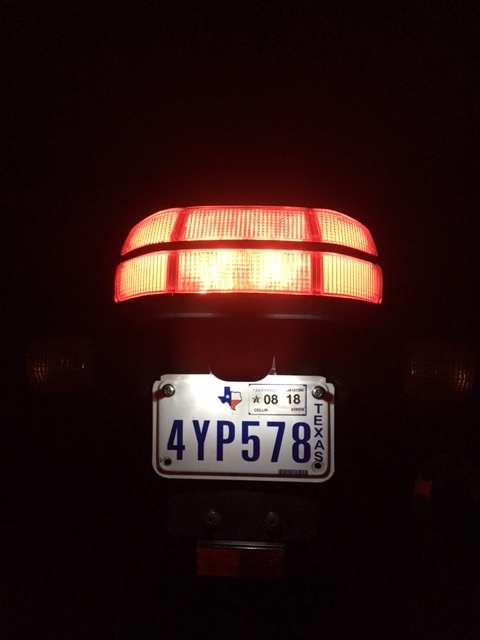 the earlier you detect our radars the earlier you will check your speed and if necessary slow down, the more accurately you pick us up the more you will check your speed. They were right about the detector. What a refreshing and sensible attitude your Police have, I wish it was more widespread and their logic is impeccable! Last edited by Hawkwind2016; 12-30-2017 at 11:30 AM. I respect and support the blue, I am a CHL holder (means law abiding in the USA). Thanks for your service and be safe out there. 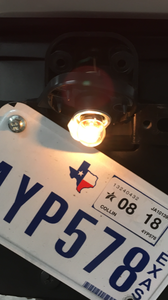 LED license plate bolts legal?